International Journal of Research in Health Sciences,2017,5,3,38-43. Associate Professor in Radio-Diagnosis. KPC Medical College and Hospital. Jadavpur, Kolkata 700 107. West Bengal. INDIA. 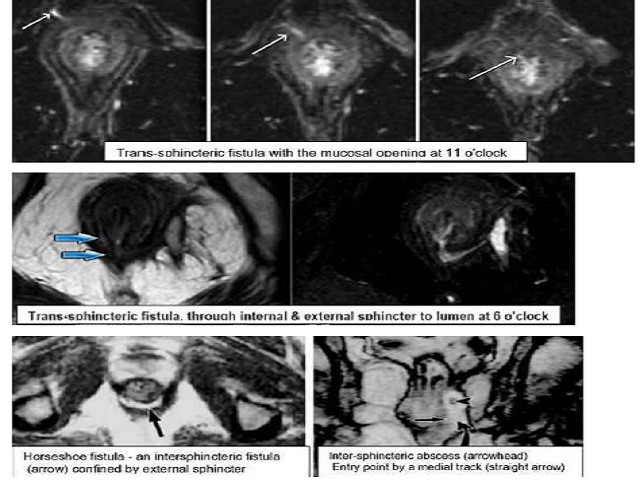 MRI study of perineum clearly depicts the anatomy in all orthogonal sections and thus reliably shows the spread of perianal fistula tract. It is superior to any other modality of pre operative study. Surgical treatment is not easy if there is diffuse inflammation and consequent fibrosis in the perineum. In these cases prior MR scanning with and without intra venous contrast, becomes useful and also in cases where initial intervention fail to detect the presence of fistula. MR imaging also demonstrates apparently occult inter-sphincteric space sepsis with no cutaneous opening. MR imaging is quite good in the prediction of prognosis of the patient and the outcome from the disease process. MRI with St James's University Hospital classification, shows that grades 1 and 2 have satisfactory outcome requiring no further surgery, whereas grades 3 to 5 have unsatisfactory outcome requiring more surgery latter on. By using this system of classicication, radiologist can alert the referring clinician to the presence of complex disease process.